Yes, my first born, my little man, is 4 years old today. I still can't believe it - the years have just flown by. We celebrated with friends and family yesterday at his Star Wars themed party. Everyone had a blast, especially the birthday boy. Today, daddy took him to the aquarium while mommy is home with the little guys baking 40 organic cupcakes for preschool tomorrow. Yes, 40. Crazy. What was I thinking? I should have done cookies instead. William got a bunch of great gifts. I wanted to come on here and share 2 of my favorite gifts that he received. 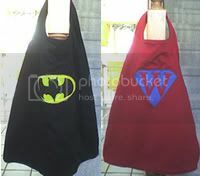 The first is a superhero cape made especially for William by my mom. It is two-sided: one side is Batman and the other side is Superman, but she replaced the S with a W. It came out beautifully. It was a huge hit with party guests too, I think my in-laws might be putting in some orders! 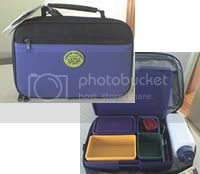 My other favorite gift was this great Laptop Lunches lunch box from my brother and sister-in-law (say hi T!). I have been wanting one of these for a year now, and I re cently was going crazy entering a contest for one over at Grab Bag Reviews. (I didn't win). I was so thrilled when she told me she bought it, such a very thoughtful and useful gift. This will definitely help me reduce the amount of waste in his school lunches. I'm a little nervous about sending it with him now, so I may wait till the fall when the new school year starts and he's slightly more mature. The last thing I want is for pieces to get thrown away. But I will use it for trips to the mall or to visit family, so he will become familiar with it. So excited!